Potassium is an essential mineral for all living things. It can be found in all plant and animal tissue, and even in the Earth's crust! Of course, we’re most interested in what potassium can do for your body and your health, so let’s take a look at that. If you'd like to know more about vitamins and minerals in general, follow us on Instagram and use #KnowYourABC. What can potassium do for your body? Potassium is an electrolyte, which means it conducts electricity. This makes it the perfect mineral to help your muscles contract when you need them to, including your respiratory system, digestive system and the muscles in your arms and legs. 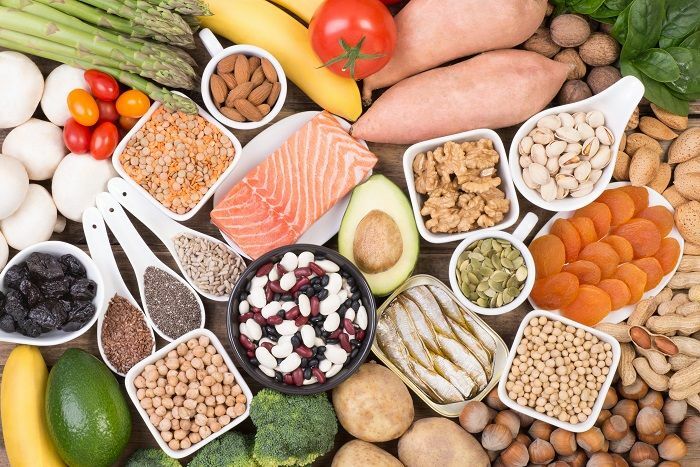 The balance of potassium and sodium in your body creates the energy needed to trigger your brain and nervous system to move your muscles, while potassium also helps them recover after exercise. Potassium helps to flush excess sodium out of the body via the kidneys. This is an important process, as too much sodium increases your blood pressure and increases your risk of heart problems. If you’re suffering from potassium deficiency, your psychological health could be one of the biggest clues. You’ll have difficulty focusing and keeping information inside your brain, while you may also feel tired and experience mood swings as a result. Getting enough potassium in your diet lowers the chance of this happening. Potassium pushes sodium out of the body, and wherever sodium goes, water does its best to follow. If your body retains too much water, this can cause edema, a condition that leads to swelling and water-related weight gain. What happens if you don’t get enough potassium? The medical term for low potassium is hypokalaemia. We’ve already discussed what potassium can do for your body, and this provides plenty of clues as to what your symptoms might be if you’re potassium deficient. Muscle weakness - Potassium helps keep your cells strong. Without it, they can’t do their job properly and you’ll find it hard to complete even simple tasks. Irregular heartbeat - Potassium helps your muscles function, and this includes your heart. You might also notice breathing problems. Constipation - Your digestive system is another group of muscles that can be affected by low potassium. Difficulty concentrating - We’ve already explained the impact low potassium can have on your everyday mental health. If you’re feeling drained, this could be why. What happens if you have too much potassium? It’s true what they say - you can have too much of a good thing. The body needs a delicate balance of potassium to help your heart and other muscles continue working properly. It’s highly unlikely that you’ll get too much potassium from your diet alone, but you should be careful about the supplements you take. If you notice any of the above symptoms, it’s important to talk to your doctor as soon as possible even if you’re confident your potassium intake is normal. These symptoms could be an indication of a wider health issue, such as kidney failure or a blood disorder. Where can you get the potassium you need? Both men and women need around 3,500mg of potassium a day. Your body is very good at absorbing the potassium you get through food. Some drugs can lower your potassium levels, so there may be a handful of cases where your doctor will advise you to eat a potassium-rich diet or take supplements while you’re on prescription medication. However, in most cases potassium supplements aren’t required, and should only ever be taken under the guidance of a doctor. Simply working the types of food mentioned above into your diet should be enough for you to get all the potassium you need to stay healthy.